At the foot of RS’ new Klehr Stairway we now have a bin where you can donate personal items and household goods to help the HIAS PA refugee resettlement. Thank you to Carole Wilder for bringing this mitzvah to us and thank you to HIAS for doing such important work! In the face of the current atmosphere of fear and Islamophobia, many of us seek ways to demonstrate to Muslim neighbors that we are their allies and know the faith that they practice is not the extremism we see in the terrorists. As a start, I have been touched by the writings of Sophia Ali-Kahn. She provides guidance in this short article; I am interested to know how you think Rodeph Shalom can play a positive role. 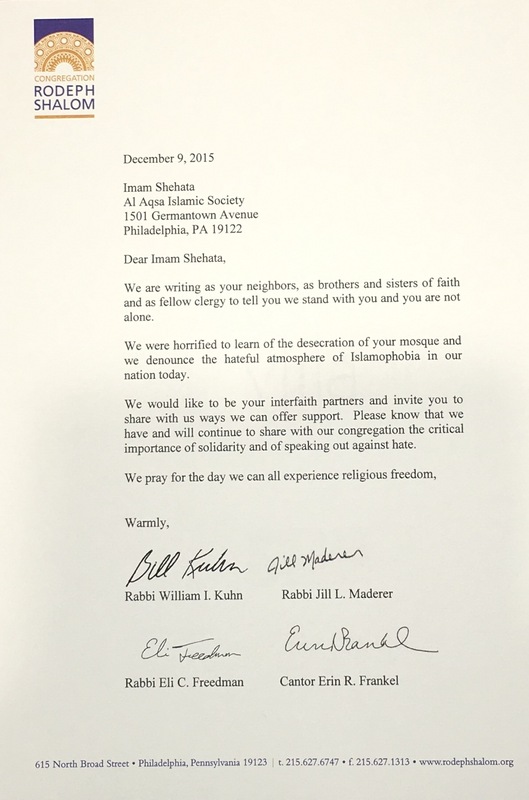 In response to the desecration of the Al Aqsa Islamic Society, a mosque in our neighborhood, our congregation’s clergy has sent this letter of support to its Imam. This Hanukkah, may the Jewish community find ways to bring light into our world. Join us for the Center City Kehillah Hanukkah Candlelighting in Rittenhouse Square, Tues., Dec 8, 5:15pm! You are currently browsing the BlogRS blog archives for December, 2015.